David Cameron has made a pig’s ear of it again. A leaked letter that he is pressuring his local council to resist the worst implications of George Osborne’s cuts is either confirmation that Jeremy Corbyn’s anti-austerity politics is catching on or that the prime minister has no idea what the implications of his own policies are in his own back garden. You decide. The debate goes that Jeremy Corbyn is the heart, Liz Kendall is the head. He speaks to true Labour values. The latter can convince once-Tory voters – critical to Labour’s future prospects – back to our party. The others split the difference. Many appear excited at the politics Corbyn’s is giving voice to. But the reality is that what he represents is not pure form of Labour politics but an extreme one. 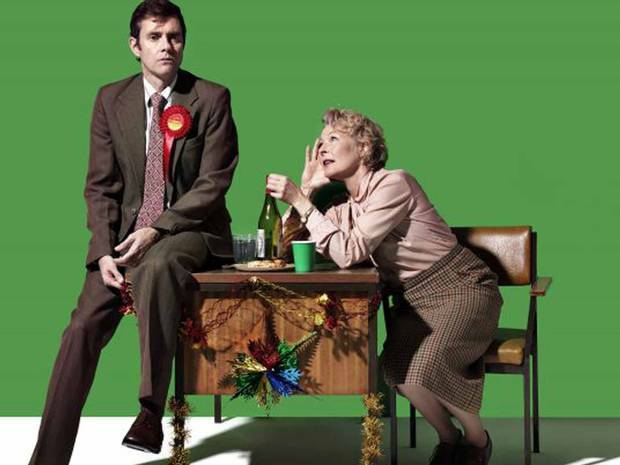 Actor Paul Higgins moves seamlessly from foul-mouthed and over-confident Downing Street operator in the Thick Of It to his latest role as contorted local councillor in Jack Thorne’s latest play, Hope. Always the bridesmaid and never the bride, Higgins is number two this time to cold Labour council leader Hilary (played by Stella Gonet) rather than hothead Labour apparatchik Malcolm Tucker. A debate organised by KCL Politics Society and New Turn, in partnership with KCL Conservative Society and KCL Labour Society. Under the title ‘Have the coalition failed?’ the event took place 6.30pm on 22 October 2013 in room B5, Franklin Wilkins building, Waterloo. Proposition: Richard Angell, former national chair of Young Labour, and Sam Coates, out-going co-chair of the Young Greens. Opposition: Oliver Cooper, chairman of Conservative Futures, and Joshua Dixon, executive committee of Liberal Youth. Progress deputy director Richard Angell addressed the International Union of Socialist Youth in Austria yesterday on the legacy of New Labour and next steps for social democracy in an era of no money, and Ed Miliband and Liam Byrne’s work on the ‘new centre ground’. Cutting waste or wasting potential? It is undeniable that the terrible cuts of the Lib-Con coalition are focused on the young. Our country’s potential lies in the hands of our young people and this government should be offering them helping hand not holding them back. To date we have seen the Future Jobs Fund axed, the baby bonds abolished, 10,000 student places erased and free swimming for under 16s cut, cut, cut.